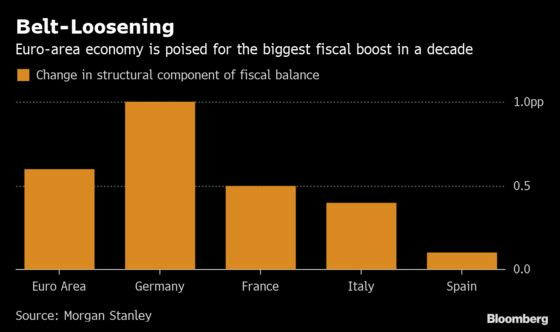 (Bloomberg) -- The euro-area economy, looks poised to get some lift from what once helped to push it into crisis: government spending. The bloc, at risk of splintering half a decade ago due to over-indebtedness, is now battling the headwinds including trade protectionism at a time when the European Central Bank has little room to lend a hand. With more and more reason to worry about the economy, a prop from additional public spending provides some relief. Morgan Stanley estimates the region stands to get its biggest fiscal boost in a decade. Even Germany, famous for its fear of profligacy, will see a pick up over the rest of 2019 on the back of government spending, according to Barclays, while France is likely to get a fillip from tax cuts introduced in response to the Yellow Vest protests. The boost isn’t a game changer, but it’s some good news for European Central Bank officials who are hoping the region will emerge from its current doldrums in the second half of the year. Along with the OECD and the IMF, they’ve long urged governments to step up, and criticized them for not doing enough to prepare for rainy days. The economy took another blow last week, with French growth slipping back, and German manufacturing dragged to its deepest slump in six years. While any fiscal boost will be welcome, it’ll pale in comparison with President Donald Trump’s stimulus that turbocharged U.S. growth. There’s also the fact that it’s piecemeal, with no single budget policy to guide the effort. 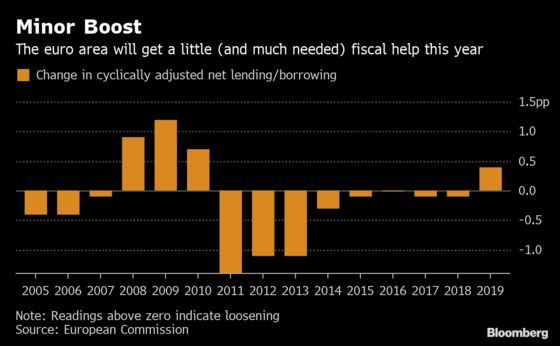 But spending more could prove problematic for some euro-area members because their debts are already getting dangerously high. Italy’s debt ratio is more than 130 percent of output, while Spain and France are close to 100 percent. One fallout from weaker growth is that while it may demand a stimulus response, a drop in confidence could increase caution and turn potential spenders into savers -- both in the private and public sectors. That may apply in Germany, which has room to spend, but is on a mission to reduce debt.